Spring need no introduction. It is a well know Java framework that use DI (dependency Injection) or Ioc (Inversion of control). I have previously written couple of posts on Spring which you can read in the Related Links section at the bottom of this post. In this post I am specifically going to write about Spring context and how is it loaded. Use combination of both. Use Application context to load your backend service, access or repository beans that will be used by entire application and your controller, view resolver beans in WEbApplicationContext. Default name of this file is applicationContext.xml. If you do not provide application context configuration file in web.xml using contextConfigLocation as mentioned in config above then file named applicationContext.xml is searched in under WEB-INF folder. There can be only one application context per web application. A web application can have multiple Dispacher servlets and thereby have multiple such webapplication contexts. 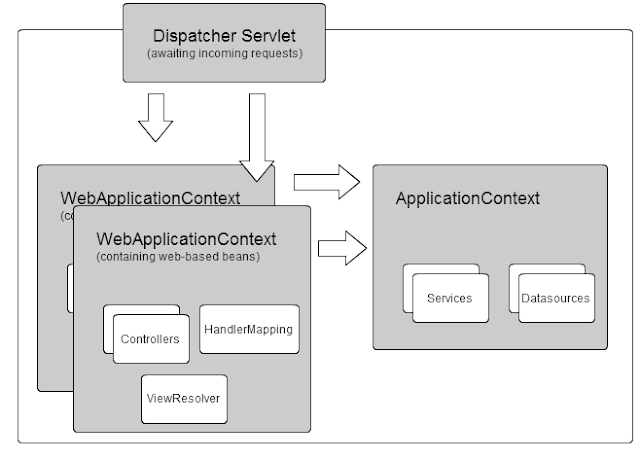 Application Context is parent context of each WebApplication Contexts. If a bean is not found in a particular wevbapplication context it is then searched in the parent application context. Application context is basically to initialize beans that are singleton in nature and can be used throughout the application like your data access bean or your service beans.